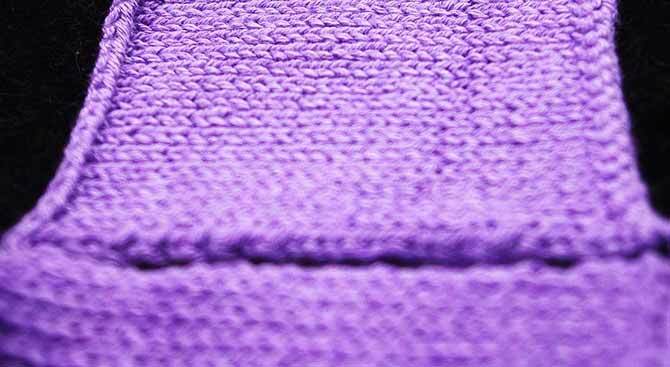 In the picture below, the 10 stitches to the right are part of a washed swatch and the 10 stitches to the left are part of an unwashed swatch. It really looks like there isn’t a difference, doesn’t it? Bamboo Pop really handles being washed very well. Both swatches look practically the same. In the previous post I talked about how Bamboo Pop is spun. In this photo, it’s really easy to see the bamboo viscose strands among the cotton. They provide a lovely sheen and depth to the knit fabric and more strength, and surprising softness to the finished fabric at the same time. When viscose is washed, it doesn’t fray, it doesn’t bloom, and it doesn’t shrink. 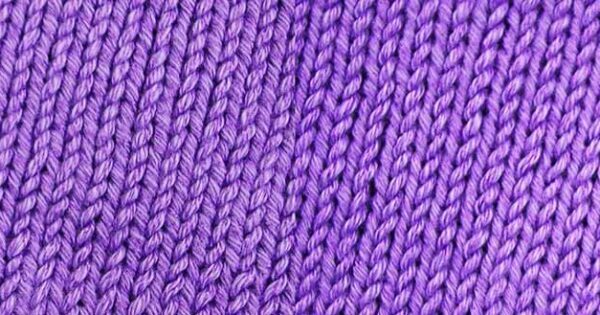 It’s perfect for a yarn that really suits knitting kids’ clothing. I knit 2 swatches with the same number of stitches and rows. One swatch was laundered in hot water with regular detergent with a load of towels and tee-shirts. Then it was in a high heat / thorough dry setting in a gas-heat dryer. The outcome was that the washed swatch changed its row gauge, but not its stitches gauge. Cotton fairly typically pulls up row-wise when washed. Often with gravity, the fibers and stitches relax and the cotton settles back to it’s regular tension. These swatches were both 11 rows to 2″ [5cm]; after the wash and dry the row tension changed to 9 rows to 2″ [5cm]. One thing that the washing and drying did for this yarn was that it evened out the stitches and the slight changes in tension that happened when I set my knitting down mid-row, to take it up later, or when I was rushing and knit tighter than usual. Washing acrylic and most other man-made yarns in cold water and putting it through a low-heat dryer cycle also evens out tension a little. Acrylic won’t shrink, no matter what you do to it, but heat can alter it, usually for the better if it’s just warm. Warm water or warm air make the acrylic fibers relax. If you’ve knit with a little unevenness and some tension changes, a warm bath is usually enough to even out these small problems. More aggressive measures are needed for curling corners or bound off edges, meaning higher heat. I usually use steam through a linen fabric to keep those problems in check. In general though your row gauge and stitches gauge will not change dramatically when you wash and dry acrylic. Be sure to read the labels of all microfiber, polyester, dacron, nylon, and other viscose yarns before washing by machine or in warm or hot water, just to be sure. The man-made bamboo viscose in Bamboo Pop doesn’t shrink or pill or fray when washed and it helped the cotton retain its stitches gauge. After playing with the washed swatch to stimulate a garment being worn (I put it in my pocket, I stretched it, I used it to clean my glasses, and I used it as a coaster), I got the row gauge back to 10.5 rows per 2″ [5cm]. Washing animal fibers in general causes felting or shrinking. Both row and stitches gauges are affected and the knit fabric looses its original shape and drape. To avoid dramatic gauge changes, it’s import to wash animal fiber yarns in cold water with as little agitation as possible. And using a dryer is not at all recommended. Squeezing out the extra water and laying flat to dry is the best course of action. I hope these few tips help you with your choices of washing hand-knit fabric. The materials the yarn is made of really can make a difference. Look out for future posts on superwash yarns made of animal fibers, where I’ll explore how those handle washing cycles. Bamboo Pop requests a machine wash but flat to dry, but I would love to know if it could be routinely machine dried as you speak of here. Just finished a toddler’s dress, and blocking it after a wash (esp. due to stretching it to open a lace pattern) caused it to jump up, however beautifully(!) a couple of sizes! Considering throwing it in the wash and then the dryer hoping it might return to previous size. Any thoughts? Have you done Bamboo Pop with lace-work that you’ve blocked that you could comment on? I haven’t tried throwing it in the dryer, but if you still have some yarn left over, try knitting a swatch, and washing and drying it as you propose. Be sure not to use dryer sheets or fabric softener as that tends to affect rayon (Bamboo based in this case) negatively. This is very helpful. Thanks for the tips! I had not set out to actually measure before, but I know my hat, which are acrylic, look the same after wash and fit better. This is good info that will be bookmarked for keeping.